Apple bacon cheddar cupcakes with mesquite buttercream are the boyfriend jeans of the cupcake world. 1/2 cup mesquite flour If you can't get a hold of mesquite flour, you can use more all-purpose flour. Although I have not tried it, I suspect that almond meal or any nut ground into a flour also might work well in this recipe. If you try it, please comment and let know how it worked. In a medium-sized bowl, whisk all-purpose flour, mesquite flour, baking powder, and baking soda. In another medium-sized bowl beat butter, sugar, and brown sugar until light and fluffy. Beat the eggs and yogurt into the butter/sugar. Alternately add the flour mixture and the apple cider to the butter/sugar mixture, beating after each addition until just combined. Fold in the cheese and bacon. Beat butter and sugar until light and fluffy (about 3 minutes on high speed). Optionally, mix in milk a little bit at a time until the frosting has a consistency you like. Note: If you don't have mesquite flour (or even if you do and want to try something different), I'd recommend my apple butter brown sugar frosting as an alternate choice for these cupcakes. 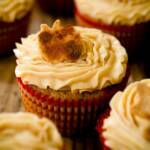 These cupcakes are topped with my homemade apple chips (get the recipe in my homemade apple chip post). Don't add the toppers until just before serving or they will get soggy.